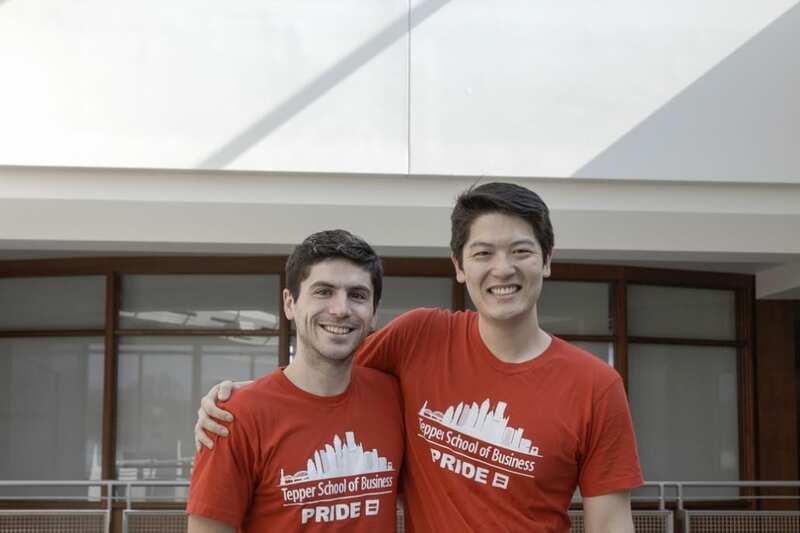 Today, I had the opportunity to have a chat with Brandon Pochatila (left) and Brandon Leung (right), current co-presidents of the Out&Allied club at Tepper. Let’s start with an easy question– Tell me about yourself and something you love about Pittsburgh! Leung (L): I’m originally from Atlanta, so I went to Emory university for undergrad and majored in finance. Due to the unfortunate timing of the financial crisis, I pivoted into healthcare consulting for 7 years. After that, I gave the ROMBA summer treks a try after I was admitted and decided that it was time to go back to finance– so I recruited for IB this past year. This summer, I will be working IB at Deutsche Bank! Something I love about Pittsburgh is the Three River’s Regatta and especially the Red Bull Flugtag event there. Pochatila (P): I’m originally from Cleveland, OH and went to undergrad at OSU and grad school at Case for BS/MS biology. Prior to Tepper, I worked for 4 years in the medical device industry in North California. I decided to go to business school to get into consulting and will be joining PwC over the summer. I love the walkability of Pittsburgh neighborhoods! How do you handle being co-President Brandons? L: But realistically, we sign off every email from both of us! P: And we definitely can’t sit together in classes! L: But on the plus side, people ALWAYS remember our names– the odds are ever in our favor! What is your favorite O&A event? P: Coming out stories, for sure. This event is a great opportunity for some of our LGBT+ students to share with their classmates their personal stories of being LGBT and how it has affected their life. It is very personal and very impactful, and unsurprisingly, it’s also one of the most popular events of the year. L: I agree with Brandon that the Coming Out Stories is an awesome event. I also really like the ally panels, in which we invite allies to talk about their experiences being an ally. These allies also provide advice to other allies in how to be a more robust supporter for the LGBT+ community. What are the strengths of Out&Allied? P: and we have a strong presence among the students and events that are highly engaging for LGBT and allies alike. How is Out&Allied continuing to grow next year? P: We are pushing some more education initiatives focused on LGBT history in the US, fashion in the workplace, and a wider-reaching speaker series. L: To be more specific on the speaker series, we will be co-sponsoring with professional clubs to provide great speaker series that cover professional and affinity interests. What advice would you give prospective LGBT students? L: Take advantage of ROMBA treks! Though them you can make great connections with companies and across MBA programs over the summer before you even start. P: Don’t worry about fitting in. LGBT populations are a vibrant and contributing part of the greater MBA community, and there is a lot of very strong support for LGBT students. What advice would you give prospective ally students? P: Don’t be afraid to engage, especially if you haven’t had the opportunity of knowing or working with out LGBT people. L: Make friends with every type of person in your program; push yourself outside the homophily* and make your network as diverse as possible! What’s it like to be out in Pittsburgh? P: I found Pittsburgh to be very welcoming and it has a high number of LGBT venues. What are you involved in other than O&A? P: I am involved in the Consulting Club board, where my primary responsibility is to write the club newsletter in addition to organizing events. I am also a member of Tepper Women in Business and Healthcare clubs. L: I am involved in the Graduate Finance Association as the VP of events. I’m excited to be running a new finance-based case competition for nesxt year! I am also a part of the Asian Business Association, Tepper WOmen in Business, Tepper United, and the Culinary Club. And to finish up, can you share one more thing we may not know about you? P: I love karaoke even though I’m a terrible singer. And I have no shame. L: I played underwater hockey nationals last summer. *Homophily: a concept you learn about in Managing Networks and Organizations that is the studied and proven tendency of people with similarities to form stronger connections easier– so the old proverb “birds of a feather flock together” isn’t wrong! **He’s a man of few words when the other Brandon is right. 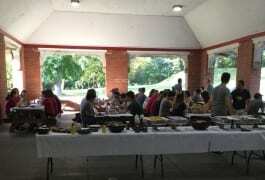 CMU INFORMS 2018 YinzOR Student Conference PhD Student/Faculty Picnic 2018!